Being the only female in a house full of males definitely has a few advantages. I know much more about engines and home repairs than I used to and, thanks to my preschool son’s toy car obsession, I can almost always accurately name a car’s year, make and model. Unfortunately, I have had to sacrifice certain pleasures in exchange for my wealth of newfound knowledge. Bubble baths and high-quality chocolates have been lost in the raging rush of parenthood. Girls’ night out has been brushed aside by the demands of my newborn. And shopping for anything exclusively feminine is out of the question. In fact, the closest I get to shopping for accessories is a quick and longing glance at a store while rushing through the mall to the supermarket. That’s why I absolutely love online shops like Sunny and Chic Boutique. Lara Stice, owner and creator of Sunny and Chic, knows how difficult going out to shop for hair accessories can be. Her shop specializes in producing beautiful, handmade and high-quality headbands for women and girls. Best of all, Sunny and Chic has reached the perfect balance of everyday elegance and special occasion dressiness. While the headbands would look fabulous worn in loose hair with those favorite jeans, they would look equally great with a formal dress and an elaborate up-do. When a woman is as deprived of femininity as I am, these beautiful hair accessories are a dream come true. Lara even offers custom headbands designed to match that perfect outfit. While I still may not be able to get out of the house and do some serious shopping, I can rest easy knowing that I can maintain a sense of style and show off my love of all things feminine without ever leaving the house. Sunny and Chic Boutique will help make sure of that. I don’t generally have too much faith in infomercials. Sure, the products often look revolutionary, but so often the claims seem unbelievable or the inventions seem unnecessary. In fact, I had previously laughed heartily at the infomercials advertising the Glass Watering Globes. The poor women watering their plants “the old-fashioned way” were so furious about their task, I wondered why the women had even bought the plants in the first place. But when Christmas rolled around and my husband and I began preparing for a three-week trip to see family, a problem arose. How were we going to keep our plants alive for the three weeks that we would be gone? “Let’s get some Glass Watering Globes!” my husband suggested enthusiastically. For lack of a better solution, I pushed my scepticism aside and we made the purchase. While I found the thin stem of the globes a bit difficult to fill with water, my husband seemed to have no problem with them and soon had them all filled and inserted. When we returned from our vacation, some of the globes were empty and all of the plants were thriving. The watering globes definitely make life a little easier around our house. While I love my plants, I am not very consistent with my watering habits. As well, I have no idea how much water to give each of my plants. Thanks to the globes, I have eliminated the guesswork when caring for my greenery. As an added bonus, my husband finds the globes so novel that he has voluntarily taken on the task of refilling the globes when they are empty. All I do now is sit back and enjoy the beauty of my healthy and thriving plants. Although the globes work better in larger, heavier pots, we have been able to make them work in even our smaller houseplants. And I have a little extra peace of mind knowing that my plants have exactly the right amount of water without any effort on my part. Any item that leaves me with one less chore to do is a winner in my book! I’ll be the first to admit that I’ve gone through some crazy makeup styles. I wore nothing but pale powder foundation and jet-black eyeliner in high school. I wore nothing but bronzer and stark-white eyeliner in my early twenties. But there was one cosmetic that I could never bear to touch. Yes, my fear of blush was almost unshakable. The second I saw it in the stores, images of sweet, elderly women with bright blue eye shadow and shocking pink circles on their cheeks would pop into my mind unbidden. When it came to blush, I had a full-fledged phobia. But all of that changed when I was introduced to the dazzling FlowerColor Cosmetics made by Ecco Bella. 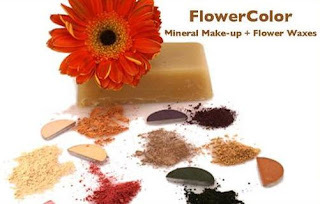 FlowerColor Cosmetics combine mineral makeup with natural flower waxes to create gorgeous shades of eco-friendly blush, eye shadow, bronzer, shimmer dust and more. The blush and eye shadow are sold to fit conveniently into the optional, fully recyclable Duo Paperback Compact to minimize waste. 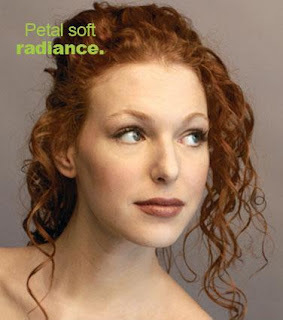 All Ecco Bella cosmetics are gluten-free and non-irritating to sensitive skin. According to Ecco Bella, flower wax is nature’s best-kept secret. Flower wax is a delicate coating on flower petals that protects them from the elements. Combined with mineral makeup, it protects skin so that cosmetics last longer. Ecco Bella states that the natural pigments in their cosmetics will automatically adjust to your skin tone. It sounded like a dream come true. But visions of clown cheeks continued to dance in my head. Two swipes of my makeup brush later, my doubts were dispelled. I chose the Coral Rose blush because I had read an article that said coral was flattering to every skin tone. In my opinion, both the article and the claims of Ecco Bella are completely true. This blush is absolutely amazing. With one quick brushstroke on each cheek and a few seconds of fingertip blending, I have a natural, healthy looking flush that lasts all day long. At that moment, I knew my days of fearing blush were behind me. As a busy mother, I don’t have time to hunt through huge displays of cosmetics to find the ones that suit me. I certainly don’t have the desire to spend money on makeup that might not properly match my skin tone. Ecco Bella’s fantastic cosmetics have solved these problems for me. These days, I no longer subscribe to crazy makeup trends. In fact, before Ecco Bella there were days that I left the house without any makeup whatsoever. But now I know that with just a touch of blush, I will look energetic, natural and a little more polished even if I’m carrying a crying baby and dragging a stubborn pre-schooler behind me. What more could any woman ask for?